Los tres personajes más importantes de la compañía alcanzan números dignos de destacarse, auqnue sea con algunas trampas de renumeración, de las que están de modo hoy en día. La revista de Batman se ve más interesante para mi gusto, especialmente por el equipo creativo. La llegada de JMS a Superman y Wonder Woman no me entusiasma demasiado, pero es la clase de proyectos que se esperaban con la exclusividad que le ofreciera DC. Un par de cosas que se ven algo fuera de lugar son la portada de Superman hecha por Eduardo Risso (perfecto para Batman, no sé qué tanto para Superman), y Joe Madureira en Wonder Woman. BRIGHTEST DAY shines its light on Star City in this oversized first issue from up-and-coming writer J.T. Krul (BLACKEST NIGHT: TITANS, GREEN ARROW #30) and future superstar artist Diogenes Neves (New Mutants)! “The Fall of Green Arrow” has ended. Now who carries the heavy bow of the Emerald Archer? Coming out of the devastation, what miraculous event has occurred in Star City and what mysteries await inside that bring the forces of good and evil in search of its lone protector? Aim for a whole new era starring Green Arrow in this exciting ongoing series! No conozco a J.T Krul, todavía nome topo con un comic suyo que tenga ganas de leer, pero difícilmente me parece el escritor adecuado para este relanzamieno, no porque no tenga talento, nada puedo opinar al respecto, sino porque la última vez que esta serie fue exitosa fue cuando se relanzó a manos de Kevin Smith. Me parece que Green Arrow es un personaje que funciona mejor mientras más anclada esté en la realidad, pero con la cantidad de relanzamientos que ha tenido la revista me parece que se necesita poner a un peso pesado a cargo de la serie, al menos por un año, para que tenga alguna oportunidad de permanecer en la parte alta del Ranking de ventas. A Diogenes Neves pude verlo en New Mutants y me gustó mucho, pero fue apenas una revista, no sé qué tal rinda con una periodicidad mensual, pero tiene material para destacarse tanto como lo ha hecho su compatriota Ivan Reis. Hush finally breaks his silence and decides to make life difficult for Batman. What is Tommy Elliot’s gameplan? And what will Bruce Wayne’s return mean for the man who’s been masquerading as Bruce all these months? Also, the final, thrilling installment of the Manhunter co-feature is here! Kate confronts a vicious enemy who has infiltrated her personal life. Everyone she cares about is in danger, and so is her secret identity! Can she protect her loved ones? And when it’s all said and done, will she decide to stay in Gotham City – or return to the relative peace of Los Angeles? No he seguido la nueva etapa de Manhunter, pero creo que este mes marca el término de un experimento fallido. No solo termina Manhunter, practicamente la totalidad de los co-features (historias de complemeno), desaparecieron de las colecciones regulares y las series de Red Circle, son los peronajes de Archie Comics (MLJ), publican su último número este mes. Tendrá que pasar algún tiempo para analizar bien el fenómeno, pero a primera vista pareciera que hubo una mala combinación entre la época que se eligió para el lanzamiento de esta iniciativa (en plena Crisis económica); mala química entre la revista central y la de complemento: y la utilización de cómics que eran mayormente de bajo perfil para el proyecto. Claramente no es lo mismo poner páginas extras y subirle el precio a la Doom Patrol que a Detective Comics o a Action Comics. War is hell — and no one knows that better than Sgt. Rock and Easy Company. Collecting stories from OUR ARMY AT WAR #149-163, 165-172 and 174-180. No tengo idea de qué tan buena sea esta revista, nunca he leido las historias clásicas del Sgt. Rock, pero sólo por el placer de mirar las páginas de Joe Kubert, debiera valer la pena gastar los 20 dólares que cuesta este Showcase de 500 páginas. New from Vertigo Crime! Frank Grissel is a hard-knuckled private eye – and a deeply closeted homosexual – set in the very real world of 1953 San Francisco. Aided by his long-suffering secretary (and sometime live-in lover) Loretta, Grissel’s search for a runaway girl winds up with his becoming a suspect in a string of gruesome murders. The case takes twists and turns through the Golden Gate’s greasy underbelly: the beguiling arms of a Chinese shipping heiress (and smuggler); an unexpected reunion with the daughter he abandoned long ago; the loss of Loretta to the sadistic clutches of the high-powered “Colonel”; and finally to the horrifying, gender-bending truth. Me llama la atención esta Novela Gráfica, no porque me interese comprarla sino por el equipo creativo... Gabrych es un tipo al que leí en cómics de Batman y nunca me pareció particularmente talentoso, pero tampoco desteñía. A Brad Rader me costó recordarlo... lo conocí porque dibujó 2 números del comic de Batman TAS por allá por 1993-94, para ser más preciso, lo números 4 y 5, donde aparecía Robin y se enfrentaban al Espantapájaros. Parece un tándem bastante improbable, más aún con el lanzamiento de una Novela Gráfica original, pero puede ser un proyecto interesante... otra Novela Gráfica que debuta este mes es "DARK RAIN: A NEW ORLEANS STORY HC"
It’s the Man of Steel versus the man known as “The Greatest of All Time” in this statue that features Superman taking on Muhammad Ali. 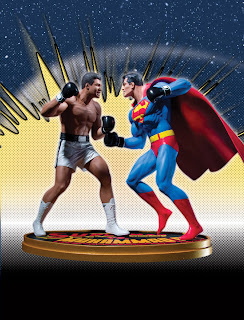 Based on the cover art of the original 1978 tabloid version of the book “All-New Collectors' Edition: Superman vs. Muhammad Ali,” this classic scene of the two greats squaring off against one another is available in 3-D form for the first time. 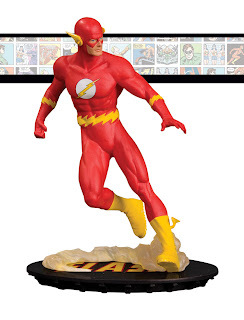 The release of this statue coincides with the reprinting of the story in two hardcover editions. (See page 102 for more information on the books.) All three products are officially licensed by Muhammad Ali Enterprises. This hand-painted, cold-cast porcelain statue includes a logo base, measures approximately 9.25” high x 9.625” wide x 6.5” deep and is packaged in a 4-color box with a 4-color Certificate of Authenticity. 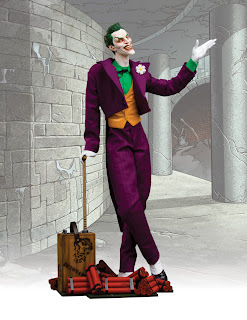 This limited-edition, hand-painted, cold-cast porcelain statue measures approximately 6.75” high x 5” wide x 3.5” deep and is packaged in a 4-color box with a 4-color Certificate of Authenticity. Las tres esculturas me parecen fabulosas y desearía tener el dinero que se necesita para comprarlas, pero bueno... tal vez en 5 años en eBay. ¿Qué opinan ustedes? ¿Qué les llamó la atención?